From the 23rd March – 21st April ‘Time Memory and Landscape’, an exhibition of contemporary landscape painting, will be on display at Long & Ryle in London. 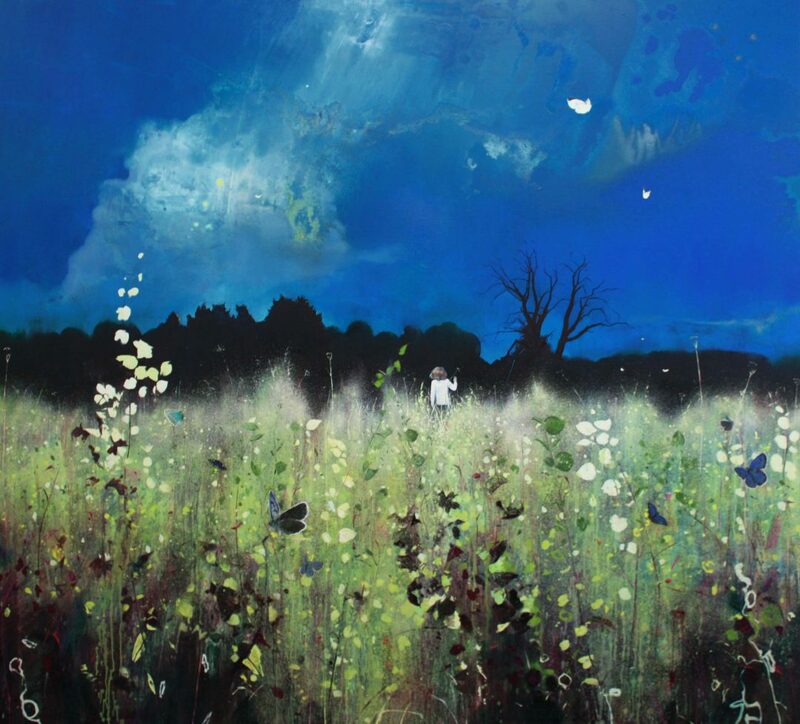 The show is curated by the esteemed painter Nicholas Archer, who has written this introduction. The genre of Landscape painting has been central to the development of the language of paint over the centuries. The subject has fallen in and out of favour with artists, but this exhibition highlights the continuing allure of landscape to contemporary painters. In particular, the search for the ‘sublime’ which is central to the six contemporary painters in this exhibition but has its roots in the work of 18th century artists such as Turner, John Martin and the German painter Caspar David Friedrich. Modern life styles mean artists are moving to rural locations in ever increasing numbers and as they do so they are searching for relevant meaning in the shrinking landscape. The English landscape is more garden than wilderness; organised and controlled by the hand of man, but this does not make it less inspiring for artists as they search for meaning in the landscape. This search is enhanced as science continues to reveal and explain the mysteries of the natural world. As the human imagination tries to visualise the world of science, so the artist turns to landscape as a metaphor for the forces of nature that can only be imagined. Mysterious links between light, space and time are central to this and our understanding of the relationship between these elements are key to our appreciation of their beauty. This exhibition has brought together six painters for whom landscape as a subject is central to their practice. All six have a mature, individual and distinctive language. But all six also have far more that links them than sets them apart. What is common to these artists is that the process of how the work is made reveals their subject. The artists all choose photography as source material over ‘plein air’; the photograph liberates these painters and has enabled them to develop highly original working methods with a wide range of materials. Mathias Meyer was a student of Gerhard Richter. He uses photographs as his source material. But like the work of the other artists in the show, the photograph is just the starting point, a catalyst to a much more creative and poetic process. He says; “What interests me in a painting is above all its function as a reminder. Every time I recall something, I have a picture in my head. This picture has little to do with photography because although the image is a clear one, I couldn’t possibly convert it into a single photograph. It’s more likely to be a composite of several different pictures. The trickles of paint or the dissolution that sometimes takes place in my works represent just such visual fragments of memory. Having said that, I naturally have no interest in creating a painting that has nothing whatsoever to do with the original motif. It would therefore be difficult for me to begin by intermingling blocks of colour and lines without having any figurative model at all, at least in my head.” Meyer pushes the language to the edge of abstraction without ever losing its roots in the landscape. In sharp contrast to this Ruth Stage shows us the minutiae of the grand vista, a landscape of illumination, pattern, reflection and great distance. Working in egg tempera she creates a fluidity that reveals dramatic skies, mountain ranges, turbulent shallows. Superimposed onto this is the ‘story of the day’ be it figures on the beach, the first moment of spring, the remnants of a crop on a frosty morning. A limited palette gives an impression of the subtlety of nature, a cluster of almost indistinguishable greys punctuated with the cadmium of a leaf, transparent in the evening glare. From this complex formula, the artist creates coherence, revealing harmony and balance without interruption. 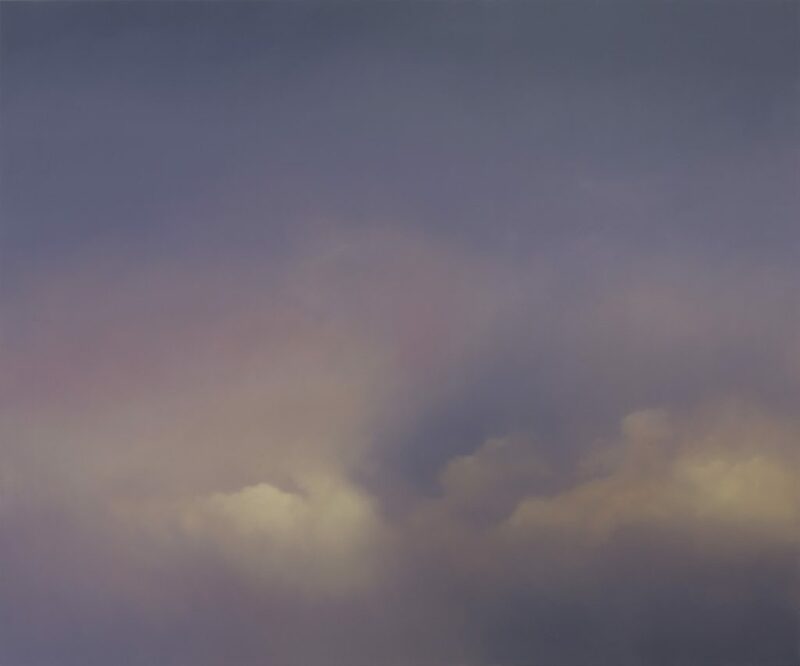 Jenny Pockley’s paintings of clouds appear to be suspended in time. They are still, beautiful; created by the fall of light. For Pockley the process of how she makes her work is vital and says something about the content of the work. Thin veils of colour are washed onto an ultra-smooth gesso surface; the tonal variations built up and softened using the ‘wet into wet’ process. The materials and surfaces used are key to the work and add to its delicate timelessness. Ultimately the clouds appear to hover and envelop the viewer. All paintings record the passage of time, even if inadvertently, but with Sophie Benson time is a far more decisive collaborator. In the same way that damp stains a wall or sunlight bleaches, these paintings act as evidence of time’s slow elapse – both in subject matter and technique – and in so doing they carry a stillness and a quiet force. Her concerns lie in the echoes of events manifested in landscape and their hold on the imagination. The subject matter – trees and lakes in one series of paintings, and icebergs in another – is suggestive of the almost imperceptible flow of nature. The flatness and translucency of the suspended pigment makes it seem, on first encounter, that you are watching a moving projection, as if the iceberg would drift out of the frame or the trees might sway in a breeze were you to stay for long enough. 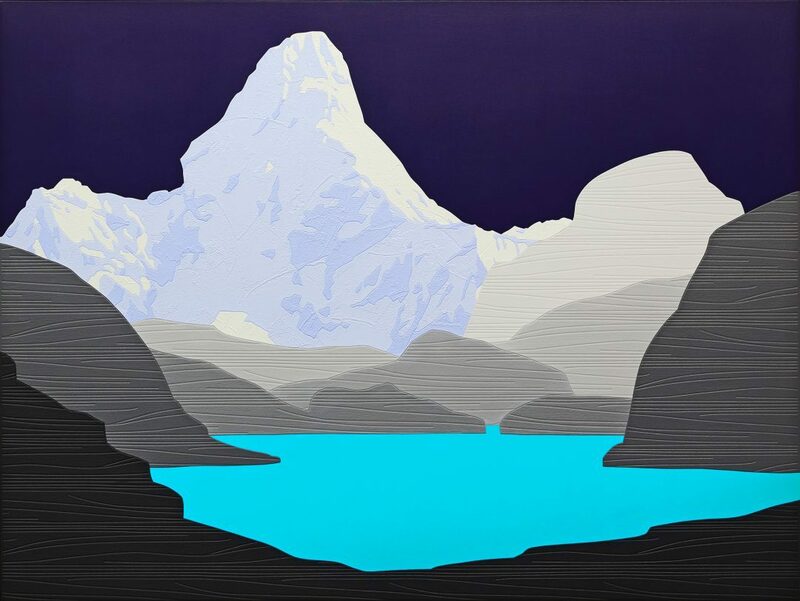 David Wightman’s paintings are created from intricately collaged wallpaper and rich colour. They create abstract compositions as well as imagery vistas. 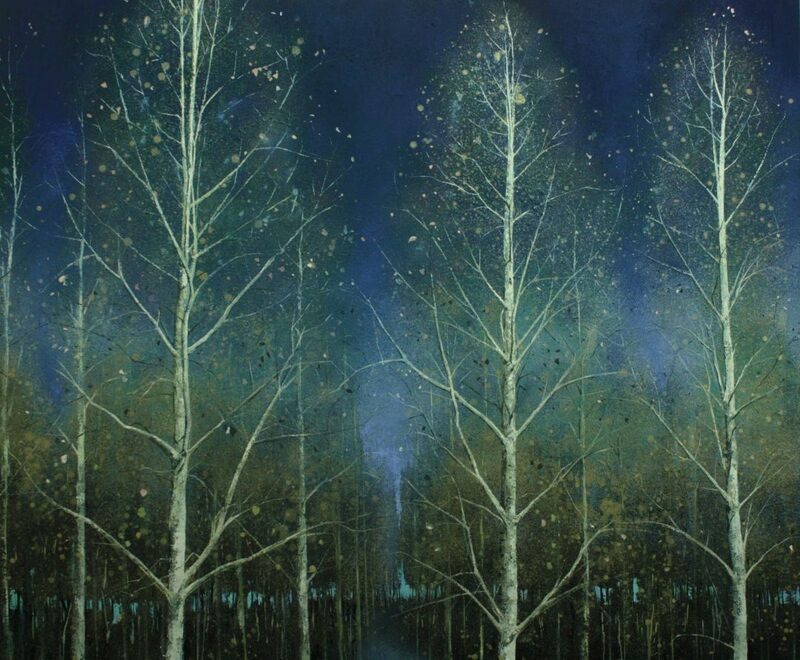 His paintings offer a glimpse of another world, seemingly real yet entirely imagined. His paintings refer to the tradition of landscape painting but he uses a variety of sources as inspiration; from postcards to classical landscape paintings. The result is a collection of sublime and archetypically beautiful landscapes that are familiar, yet fictional. 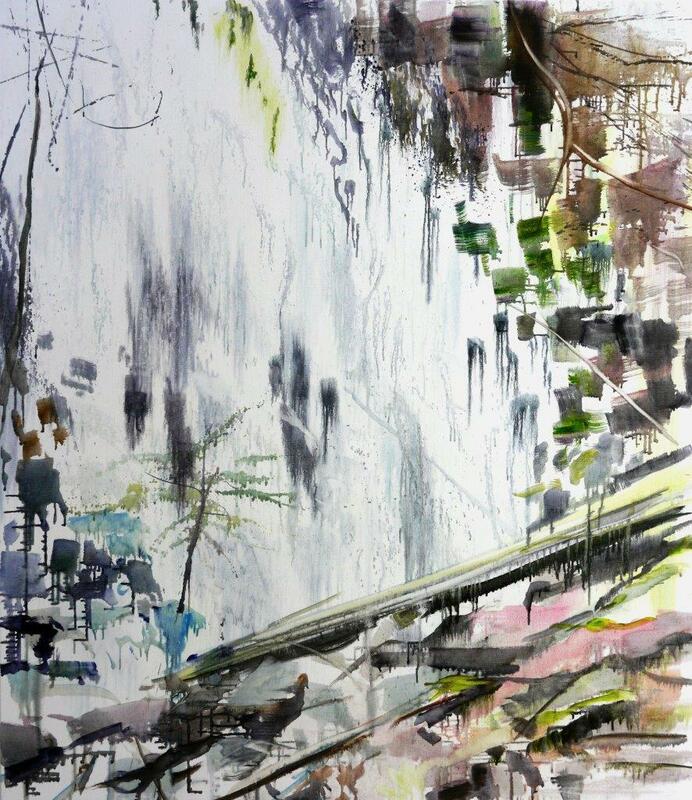 Finally, my own work has focused on landscape since leaving London 10 years ago, in search of the ‘rural idyll’. 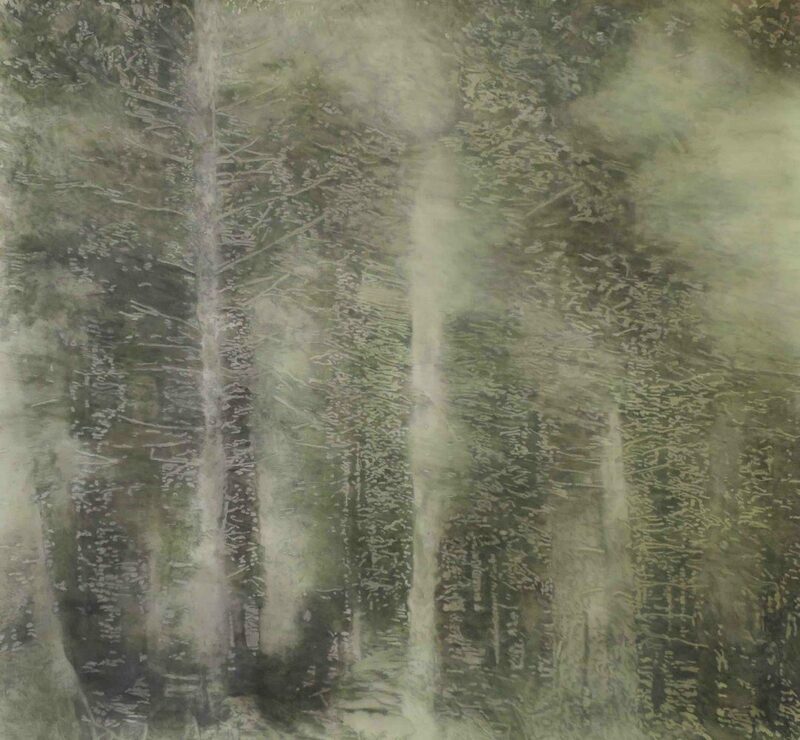 Themes develop whilst working on my paintings, whether it be the rows of trees in the series of forest paintings which suggest the passing of time, or whether it is the meadow with a small child overwhelmed by the scale and beauty of the natural world. I am not attempting to capture something about a particular place or time, rather a notion or idea of landscape in a grander sense, something in our imagination which refers to traditional fairy tales and time gone by. Like the other painters in this exhibition, it is through the painting process that this is revealed. My practice involves pouring and layering paint which builds up a surface into which a motif is woven. It is in the layered surface, like an archaeological find, that the passage of time is revealed. us in the present but is essential for our future.